Now 17, Sean Anderson (Josh Hutcherson) receives a coded distress signal from an island where none should exist. Knowing that he will not be able to dissuade Sean from tracking the signal to its source, Hank (Dwayne Johnson), Sean's new stepfather, joins the teen on a quest to the South Pacific. Together with helicopter pilot Gabato (Luis Guzmán) and Gabato's feisty daughter, Kailani (Vanessa Hudgens), they set out to find the island and rescue its sole human inhabitant (Michael Caine). A Dangerous Method, Safe House and other film events around town. 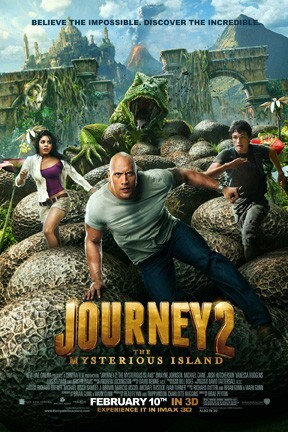 Journey 2: The Mysterious Island is not showing in any theaters in the area.